Compare prices from several car hire companies in El Hierro and find the best price for car rental. Our prices always include unlimited mileage and insurance. El Hierro is the name of one of the Canary Islands located just off the African west coast in the north. El Hierro is the furthest west of the Canary Islands and is the least of these. In 2003, there were approx. 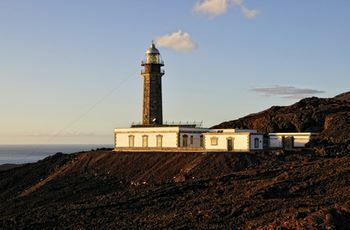 10,000 inhabitants of El Hierro. Like the other islands in the archipelago, this is also a popular tourist destination, but traffic is not as intrusive. The landscape is characterized by steep cliffs and beaches, and Valverde is the main town on the island. Diving is a main attraction of El Hierro and that there are opportunities for paragliding. Arqueologicas Village of Guinea is an archaeological site with a firfislesenter. Airport El Hierro Airport is approx. 2 km outside of Valverde and offers flights to Gran Canaria and Tenerife.